Never underestimate the value of a sheet protector – or your role in filling it. The missionary teacher seemed almost apologetic as she described what she would like me to do. “You didn’t come all the way to Haiti to put pages in sheet protectors,” she said, “not as much fun as working with the kids…”. 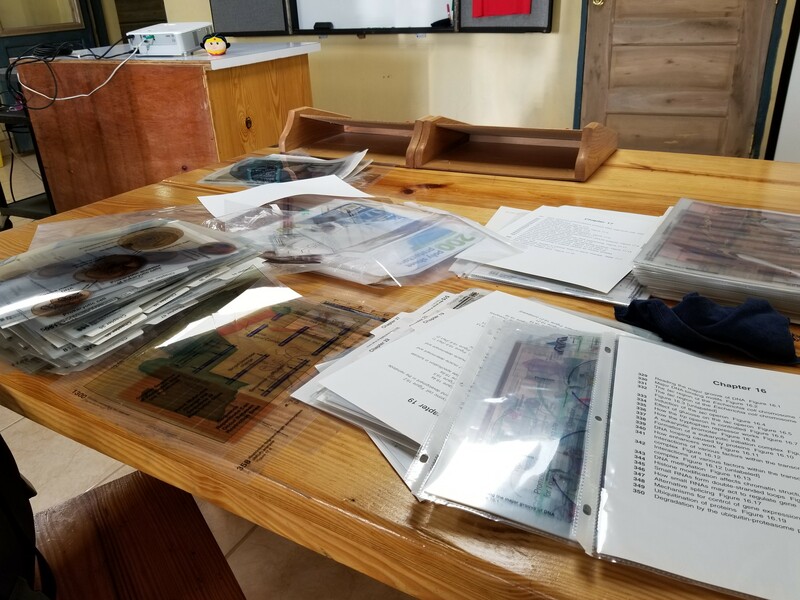 But this simple organizational task was precisely the thing that would help her the most, so I set to work sorting the 1300 transparency slides. The box had deteriorated in the tropical humidity, allowing the stack to fall over. The slides were now out of order and covered in Haitian dust. I spent less than three hours sorting, wiping and putting them into protectors, but I could tell when I was finished that the simple binder meant so much more to her than she could express. In truth, I did travel all the way to Haiti to ‘put things in sheet protectors’. And to carry cases of water, set up tables and move chairs. To hold a ladder or a hand… so many small and ordinary actions that are easily overlooked in the busyness of daily life, yet so very valuable. That is one of the beautiful things about short term mission trips. For a little slice of time, we leave behind all of our pre-defined roles, our occupations and expectations. While we might draw on our individual experiences and knowledge, we set aside titles and hierarchies to work together on whatever needs to be done. We find that when we are willing to do any task put in front of us, we bless others in unexpected ways. It’s interesting, isn’t it? That a couple hours and some sheet protectors can be as big of a blessing as all of the complex plans and projects that we might come up with on our own. It’s a blessing because it is so perfectly matched to the person and the moment in a way no one of us could have known. But God knows. He knows what is truly needed. If we are willing to set aside our agendas, listen, and move with Him, we just might find an unexpected blessing of our own.